Day 14: Firts day of the year/Destination Monkey Island resort. Early rise and the first day of the year. Breakfast and coffee fill the tanks. 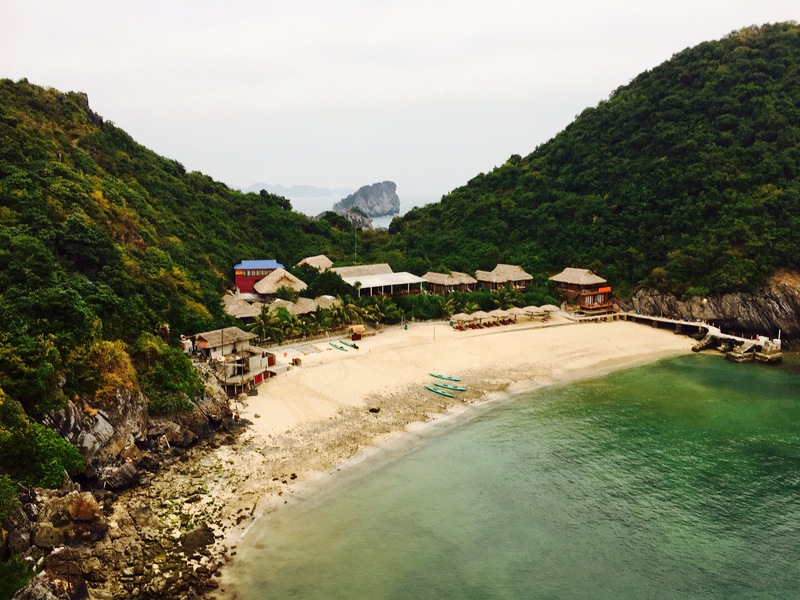 Our private driver is booked, car packed and off we head in the direction of the coast, Cat Ba Island. The highway is 3 lanes and empty, it’s a little surreal from the usual Vietnam road experiences. The trip is easy and we find ourselves dropped in front of the ticket office for the fast boat over to Cat Ba Island, tickets booked, boat boarded we head up the channel of the port passing huge shipping container tankers, tug boats and local fishing vessels. Murky muddy polluted water gives way to clear fresh aqua blue ocean. Bird life appears in the form of gulls, terns, and sea eagles. Little outcrops of islands begin to appear, nature engulfs us, it is so beautiful. Easing into the port we are surrounded by boats, sun, chitter chatter and island living. A short taxi ride to another little port and we jump on a small junk boat and make our way to our accomodation. The sea breeze, clear water and towering island formations are spectacular. Around a corner we turn, in front of us our resort, straw huts and palm trees with our own private beach and lookout. In my mind I think it can not get better than this. It could not be further from the truth. Previous postDay 13: Hanoi to New Years Eve destination. Next postDay 14 & 15: Mankey Island Resort.